…And we’re back! … and we’re gone again! A New Host: After some weeks, the Photo Tourist has returned from internet limbo. We have transitioned to a new web host, and the site is back up and running. A couple months ago and for several reasons, I became dissatisfied with my old hosting company and resolved to move. The old company, it seems, is in the habit of overselling their inexpensive server space and queuing transactions. Performance suffers unless I pay them for premium, dedicated service. This site was never going to work right (within my budget) under those terms. Apologies to anyone out there in internet land who might find you need to rejoin the site or if your comments have gone missing. If you’re bugged, shoot me a line and I’ll try to make it better. 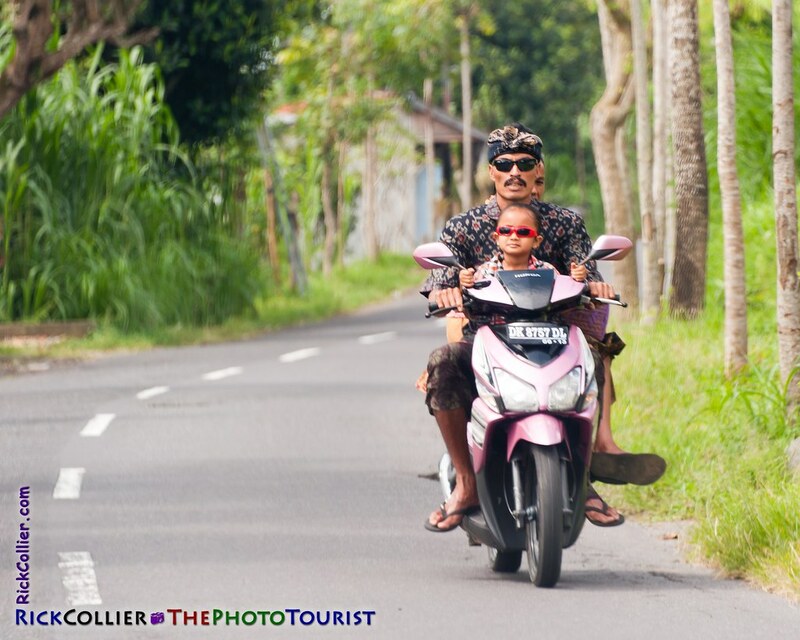 Oh yeah — about the photo: Motor scooters are ubiquitous on the Indonesian island of Bali. As it was explained to us, they are frequently the only family transportation. For those without means to own one, they are commonly rented by the day. It is not at all unusual to see entire families of three, four … up to six, all crammed on one scooter, buzzing down the road. Couple this with traditional Balinese dress for temple days, and the photo opportunities abound. While western sensibilities worry about the safety of the situation, the heart is always captured by the sight of a little one in front, clearly loving the wind in her face and the view from between her father’s arms. Sometimes the child is grinning and other times she is trying to be serene and cool. Either way, that pure, simple, innocent joy is contagious. This entry was posted on Tuesday, September 20th, 2011 at 20:01 PM. It is filed under Land & Air, thePhotoTourist and tagged with Bali, Balinese, child, daughter, drive, driving, family, father, highway, Indonesia, man, mo-ped, moped, motor, motor scooter, outing, road, scooter, sun glasses, sunglasses. You can follow any responses to this entry through the RSS 2.0 feed.